SUREE TOWFIGHNIA - Director/Co-Producer of Crying Earth Rise Up (www.cryingearthriseup.com) is an intimate portrait of the human cost of uranium mining and its impact on sacred water. It tells a timely story of protecting land, water and a way of life. A nearby uranium mining operation is extracting ore from deep in the ground by tapping the High Plains/Ogllala Aquifer, a huge underground cache of water covering 174,000 square miles from Texas to South Dakota which supplies drinking water to 82 percent of the people who live within the aquifer boundary. The mine's planned expansion further threatens the aquifer. 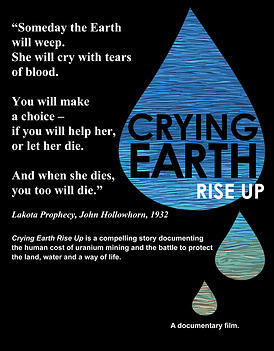 Crying Earth Rise Up is an intimate portrait of the human cost of uranium mining and its impact on sacred water. It tells a timely story of protecting land, water and a way of life. Please help us make a difference and get this film out to audiences! Prairie Dust Films and Crying Earth Rise Up have run out of funds and are in the middle of an exciting crowd-source campaign on KICKSTARTER. Please click image to go their website and donate and share on your Facebook. Its important! JOEL HEATH - Director of People of the Feather (www.peopleofthefeather.com) Featuring groundbreaking footage from seven winters in the Arctic, People of a Feather takes you through time into the world of Inuit on the Belcher Islands in Hudson Bay. Connecting past present and future is a unique cultural relationship with the eider duck. Eider down, the warmest feather in the world, allows both Inuit and bird to survive harsh Arctic winters. Recreations of traditional life are juxtaposed with modern life in Sanikiluaq, as both people and eiders face the challenges posed by changing sea ice and ocean currents disrupted by the massive hydroelectric dams powering eastern North America. The eyes of a remote subsistence culture challenge the world to find energy solutions that work with the seasons of our hydrological cycle.